Small business owners who want to spend their time running their business, can save time and the hassle or manually managing payroll. $20 per month + $4 per month, per employee. Affordable payroll designed for small business. Backed by our 100% accuracy guarantee, you can be confident in tax remittances, issuing pay stubs, new hire reporting and year end tax forms. Wave makes it easy to save time and get back your work day. Feel good when you calculate, run and pay your employees and contractors on time, the right way! 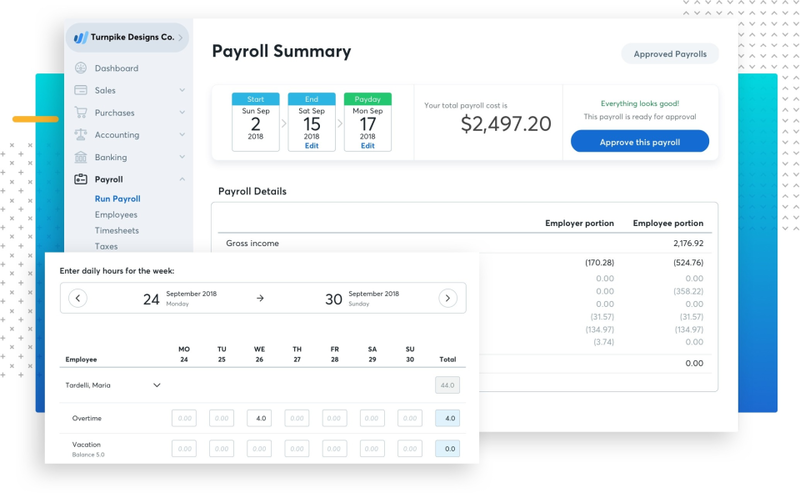 Payroll by Wave Reviews Recently Reviewed! Pros: I absolutely love Waveapp. It is easy to use to manage my client invoices, estimates, employee payroll, and track business expenses. Cons: The only drawback is waiting several days for funds to be transferred to your bank account. When my clients make a payment, I get a notification that I have been paid, however, those funds take a few days before they actually show up in my bank. It would be great if Waveapp was a bank as well. Simple and easy to use as their name! Pros: No longer have to fill out and turn in paper time sheets. Its very easy to use for all level employees. Cons: At the end of every week it takes about 6 hours to punch in and key all missed punches from employees. But I do recommend the use of this software. Cons: The invoicing was/is clunky. You only have 3 designs to choose from. I haven't found a way to import designs from another invoicing software that I was using. I'd kind of like to just have one......but it's not too important right now. Overall: Super simple. We were actually able to get everything set-up in 4 hours, not missing a beat, employees were paid on time and reporting cash in - cash out doesn't require a degree from MIT. Pros: I have been using this for payroll and book keeping for the last several years. It is super easy to use and has almost all the features I need. I create T4s on it and can invoice clients! Cons: I wish it could allow staff access to enter their own hours then I could approve them. This feature would make a big difference! Pros: Ease of use, customer service, price, features & design. Cons: Some solutions require a work around that is not intuitive. Overall: With wave accounting I am able to easily create invoices and bills. I am able to effortlessly pay contractors & employees with direct deposit. Pros: It's a great software for billing and invoicing clients, vendors, employees, and independent contractors. I love the ability to send the invoices via email and getting paid within the system. It's simply, easy to use and have a variety of features including, connecting your financial institution to the app for payment, saving and exporting data and interface is very clean. Cons: The mobile interface does not work very well. The app sometimes crashes. Other than that, there no other cons with the software. Comments: We have been using Payroll by Wave for quite a few years now and are very happy with it. We are one of the top immigration law firms based in Pittsburgh, PA and our mission is to provide affordable experienced representation and personal case handling to cost-conscious clients and businesses. We have very caring and passionate employees that help us achieve our mission. Payroll by Wave is the perfect solution for our small business needs for running payroll and managing vacation time. It is very easy to use with a very well designed and intuitive user interface. It guides you through the setup process if you are a new user. It has several features such as Reminders, Payroll Review, Direct Deposit, Tax Reporting and Tax filing (we do not use the tax filing feature since we already had a process in place before it was introduced). It is integrated into the Wave accounting platform (we use some other Wave apps as well) and has support for both full-time and part-time employees. Signing up new employees is straightforward. The Wave Team provides excellent customer service and responds to questions / requests in reasonable time. They are also open to collaborating with their clients to get feedback and make the solution better. Pros: This is the best place to organize payments, finances, and payroll. Seriously! It's so easy to setup and a breeze to use. I feel hugged everytime I use wave. They added an Accounting area that it's amazing. I can't say enough how much I love this program. They integrate with paypal, your bank account, etsy! You can create your own invoice template with your logo and colors for free! Cons: I can't find anything in waves that make me want to find another service. There are no cons, they keep adding new features. Pros: I love Wave! It is awesome. The payroll feature is easy to use and the transaction tagging is very easy. Cons: I do not have very many complaints if any at all. The support staff responds very quickly to any issues or concerns that a user may have. Cons: Not much. Really good product. I love the payroll feature too much to have a con. Overall: I love that it is easy to use and figure out. Costumer service is helpful. Very affordable. Perfect for my small business. Pros: Its Free and very easy to use. Many options. Comments: Previously I had QuickBooks online. They were ok, but they cost me about five times the price, and their system has certain traditional accounting options that are way too much for me. Wave does great simple accounting at a really cheap price. I recommend it for any small business owner who needs something they can handle on their own without hiring their own accountant. The only reason I didn't give Customer Service 5 stars is because these folks are located in the eastern time zone and I'm in Hawaii, so I basically never got to talk to them when I paid extra for the phone support because they yabba-dabba-do on home at 5pm EST -- pretty classic, old fashioned business hours. Now I'm back on e-mail support and it's fine -- cheaper anyway. Phone or e-mail, the support staff are all genuine and work with you on a sincere one-to-one basis... no BS'ing or shining people on. Good people; focused, and responsible. One of my favorite pieces of Wave Apps! Pros: The Payroll section of Wave is wonderful. After getting it setup it only takes minutes to enter in timesheets and run it. Pros: Payroll by Wave is very easy to use, very intuitive, and it's great that it sent payroll reminders and showed you the total amount to withdraw. Direct deposit is another handy feature! Cons: No complaints at all! I only had good experiences with Payroll by Wave! Comments: We've been using Wave Payroll for the past two years for both Canadian and US employees. It's by far the easiest service we've ever used. - Employees have commented how easily and quickly they get their tax information and direct deposit setup. Payment by direct deposit works great every time, if they have questions, they can view their stubs online easily. I absolutely love it! Just get excited thinking about going back! Pros: I love the simplicity of it. I am not an accountant, and they make me feel like I am! Haha I love that I feel secure using them to. Cons: Personally, it's not that the customer support is bad, but it's not as attentive to me as I would like it. Pros: This has been the best online payroll tool we've had. Although, since you can have it for free it can surprise as to how good the product is. Not complicated at all, very user-friendly and most important, gets the job done. Cons: I really share no bad feelings towards the product. Ever since we've used it for our small company it has worked very well. Cons: They don't have full services payroll, and support is slow to respond. I imagine this will get better over time. Cons: Cannot schedule off-cycle pay runs. For most business owners not being able to schedule off-cycle pay runs is an excellent safe guard to ensure (in Canada) that CPP and EI calculations are correct. As a professional I sometimes need to do to do this and have developed workarounds to ensure that Wave payroll still is my solution of choice. Overall it's an excellent product with great customer support. Comments: Payroll by Wave makes it easy to schedule payrolls; adjust deductions, salaries, bonuses, and so on; it handles automatic remittances; and it's affordable. It has an intuitive interface. I can fully recommend it after having evaluated it against its online competitors, having used it for 2 years, and having come from many years of struggles with ADP. Pros: Best thing about it is that it is free but the features are amazing for a free tool. It has a dashboard that allows you to see charts for overdue invoices, bank accounts and credit cards. The invoice templates are great, as this makes it easy to use and you can customized them too. Great way to track and use. Cons: My biggest problem was customer support, very limited and useless. There is a hidden fee that is not mentioned which should be disclosed. A bit of a trust issue with this system. Comments: I have been utilizing Wave's services for a while now. It started with invoicing only and I have since upgraded to Payroll by Wave. Their communication and services are both excellent, as well as their pricing. I recommend any small business owner to make use of their services. You speak to real people and they are very at tentative and knowledgeable. They even go out of their way to help find solutions to your questions they don'e "have to answer". Great experience. Cons: It's not as intuitive as QuickBooks is. Quickbooks will start to recognize transactions over time and default categorize them for you, Wave has not caught up with that yet. A simple, user-friendly interface for small businesses that want to ensure they are abiding by payroll regulations. Works well when set up with direct deposit. Customer support is usually timely and quite helpful. Doesn't handle vacation accrual very well and does not include vacation payable in reports so manual calculation required. Somewhat inflexible regarding date changes. I am a CPA that provides bookkeeping and tax services to business persons using the Wave software. Comments: The payroll module in Wave is very easy to use once set up. It can process payroll, take funds from your account and direct deposit to the employee's account as well as make the payroll deduction remittances for you. The cost is very low and the module integrates into the accounting software thereby saving many steps. Anyone that requires payroll I recommend they use Wave. Best payroll product on the market! Comments: Wave Accounting is definitely one of the best companies for accounting, and their payroll app has really come out on top! It's easy to use, easy to learn, and the user experience is optimal. The customer service is by far the best in the business. The pricing is so inexpensive that you cannot go wrong! I wholly recommend this product to any small business! Comments: Payroll by Wave is an easy-to-use system for processing your payroll in-house and also offering direct deposit. This platform is integrated with Wave's general accounting software, which helps reduce the need for additional manual journal entries. Very straight-forward. Pros: Self-service web interface is fairly easy to use. That's pretty much all I like about this application/service. Cons: Wave Payroll's customer service is extremely poor. It's almost impossible to reach Wave Payroll agents by phone. Emails to Wave Payroll Support are sometimes do not generate a response. Agents contradict each other statements. Basically, it's a crazy house there. Missing features of most payroll services. Many states are not supported. Pros: It was free and linked with the bank immediately. It was somewhat intuitive although it was not clear how to disconnect certain bank accounts while leaving others connected. Cons: It kept disconnecting link to bank accounts without users changing anything. Had not even logged in and it was disconnected repeatedly. Overall: Wave requires a lot of user intervention. It is a great, free option and has an app on phone but you will need to keep up with it, as banking link is inaccurate or often disconnected. Im sorry I think this may have been posted on the wrong software. WAVE is a learning platform for risk management and does not link to any type of banking or e-commerce. Comments: I've been using Wave Payroll for over a year and I'm not sure I'd still be running my business without it. It does all the work of navigating the CRA hurdles and with direct deposit, it really is a 2 button operation. Comments: Integrated well with WAVE cloud accounting. Payroll features are easy to setup and control. Email alerts tell me when to run payroll. Nice. Cons: They like to hold your payments and want to harrass your customer by asking personal questions. Overall: they hold my payments so they can find information about my customers,that makes bad business i dont use this invoice anymore. For those thinking its good wait until they hold your payment then ask stupid questions about your customer. Pathetic.. Recommendations to other buyers: find another software to use not wave.. I found it very intuitive to use and set up. Pros: It does everything I need it to. I found it very easy to set up invoices, online payment options for clients, recurring billing for clients, and more. Pros: The tool has nice features and a nice dashboard, that is it really. Cons: They ask for personal information which is irrelevant for the product, especially when in 2017 the keep telling young to give your personal information liberally. Pros: It takes away the stress of choosing the right layout for invoices. It provides many templates to pick from and colour customizable. Entering the information for the invoice is easy to follow. It also gives you the choice to do direct deposit to your bank. Cons: The program runs a bit slow at times, an upgrade on the speed of the website would be helpful. Pros: I don't, it doesn't work. I thought I was signing up for payroll, that it was free not for additional fees. It worked for a month, then stopped. Had to go through the process again. Then again the connections did not work. There is nothing I like about this software. Cons: Negative option for signing up. Lack of user friendly interface. Dropped connections for Direct Deposit. Not easy to sign up, issues after we've gone through the process. Overall: Great ideas - bad implementation, less than optimal user interface.